Season dishes to perfection, whether at home or on the high seas with these shakers. Allow us to cruise this design by you. 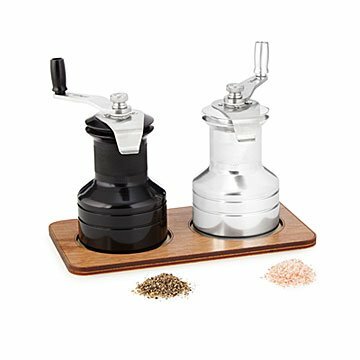 Inspired by a classic sailing winch, these sleek grinders give meals a delicious sprinkle of seasoning. Each mill is constructed from durable stainless steel, aluminum, and ceramic, adding a nautical touch to your tabletop. Finished with an elegant cherry wood base, they stay secure whether you"re seasoning at home or on the high seas. Spices included. Made in China. Problem resolved quickly by uncommongoods. Materials are correct for living in a saltwater environment.